Greetings! Have you recovered from the election? There was something for everyone to be happy about and I am just glad that everyone everywhere will stop telling everyone else to vote. Even Sweetgreen sent me an email to vote. I get it and I am very happy there was such engagement for a mid term but I can’t say I am sad it is over. How do we celebrate? 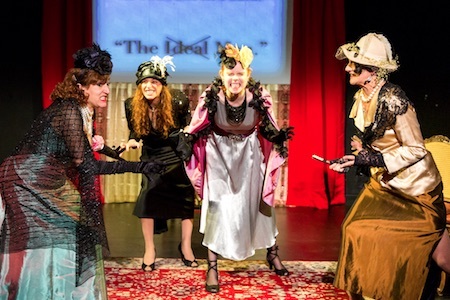 Tonight, to celebrate all the new women taking their place in the House, I suggest SCENA Theatre company’s all-woman take on the Oscar Wilde classic A Woman of No Importance at the Atlas Performing Arts Center. Set in a 1930s Hollywood, the show takes feminist take on that backstabbing world. Tickets are $15-$45. Friday kicks off another Emporiuyum foodie fest at Union Market. That evening is a preview of the weekend’s gluttonous fun with some treats such as learning to mix cocktails with Modern Bar Cart and pipe frosting from the pros at Buttercream Bakery. Tickets are available here. The Fridge hosts an opening reception for the DC Street Sticker Expo from 7 to 10 p.m. Sticker art from around the world will be on display. The reception is open to all. Saturday, support men’s health at the Movember Pig Roast. The event is taking place at Little Miss Whiskey’s Golden Dollar, 1104 H Street NE, and tickets are almost out. Details here. It’s also another used book sale hosted by the Friends of the Southeast Library. The sale is usually 10am ish tp 3pm ish and features a range of finds. It’s also the Second Saturday of the month and fans of Capitol Hill Books, 657 C Street SE, can expect free wine and cheese plus 10% off their purchases from 4 to 7 p.m.
We Happy Few’s A Midnight Dreary takes its final bow at 2 p.m. at Capitol Hill Arts Workshop. This is the third installment of the Horror Trilogy the company has been performing in repertoire and it puts one on in the mood of the spooky tale master Edgar Allen Poe. Tickets are $15. Sunday, Capitol City Symphony presents Jupiter and Beyond Part of the Great Masters, Young Star Series at the Atlas Performing Arts Center. As part of its ongoing efforts to highlight young classical musicians the performance will feature Tan Nguyen, 2018 winner of the Ylda Novik Memorial Concerto Competition for Pianists, performing Saint-Saëns’ popular Piano Concerto No. 2 in g minor. The orchestra will also perform Mozart’s Overture to Don Giovanni and his exceptional final symphony, “Jupiter”. The concert is at 5pm and tickets are free for those under 17 and $15 for students and $25 for adults. Purchase yours here. Wednesday November 15, Capitol Hill Village presents Talking Turkey – Science, Values and the Future of Food, a lecture by Dr. Catherine Woteki about the food we eat, today and in the future, based on her lifetime of research into the science of human nutrition and her understanding of the food industry and national food policy. The lecture is free and open to all and begins at 7 p.m. at the Southeast Library.